Available November 21. Rated PG. Earnest, quirky animated tale about an orphan farm girl who dreams of becoming a ballerina in Paris. With its clichéd ‘follow your dream’ story line, “Leap!” won’t win any awards for originality, but its positive and inspirational vibe hits the right notes. 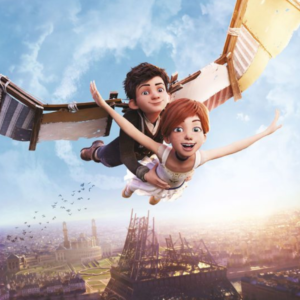 Elle Fanning voices the heroine, while Dane DeHaan does a nice job as her friend, a boy who wants to be an inventor. Available November 21. Rated R.
“The Hitman’s Bodyguard” is an unashamedly ridiculous action comedy. There is blood, gore, violence and foul language galore with Ryan Reynolds and Samuel L. Jackson showing nice chemistry as a bodyguard assigned to protect a hitman who must testify at an upcoming trial. The mayhem and goofiness is brainless and fun, if a bit by-the-numbers. Available November 21. Rated PG-13. A dazzling, ambitious science fiction movie from director Luc Besson—famed for films such as “The Fifth Element” and “Leon: The Professional.” “Valerian and the City of a Thousand Planets” is stunningly beautiful, imaginative and face-paced—the action never lets up. If anything, it probably suffers from too much going on. The film revolves around special operatives Valerian and Laureline as they try to save the universe from a dark force. “Crooked House” is an old-school murder mystery based on a novel by Agatha Christine. Set in the 1950s, a former spy-turned-private detective is hired by his ex-lover to solve a gruesome murder at a sprawling English estate. The film has all the classic murder-mystery elements—jealousy, hidden secrets, lies, deception and a cast of characters that are all suspects. Darker than many Christie books, “Crooked House” is a treat for fans of the genre. The fine cast includes Glenn Close, Max Irons, Christina Hendricks, Gillian Anderson, Terence Stamp and Julian Sands. Available November 28. Rated R.
Director Steven Soderbergh’s latest caper flick (he also directed “Ocean’s Eleven”) is smart and clever and silly—not to mention one of the most fun movie’s of the year. The film follows two dimwitted brothers (Channing Tatum and Adam Driver) who plan a robbery during a NASCAR event. You will find yourself laughing out loud. The outstanding supporting cast includes Daniel Craig, Riley Keough, Katie Holmes and Seth MacFarlane.